If you've been mock drafting lately, you've probably seen that the running back position is the most coveted position in the first three rounds of 12-team PPR drafts. Running backs are flying off the board, most likely due to the fact that wide receivers had such a down year in 2017. A solid PPR running back can lead your team to victory. Todd Gurley, Lev Bell, David Johnson, Alvin Kamara, and Kareem Hunt all caught a lot of passes out of the backfield last year. But we aren't here to talk about the studs. We are going to focus on some players that are currently being drafted a bit higher than they should be. These are the players that have some risks, and unfortunately for fantasy owners, may not have enough reward to outweigh the downside. Leonard Fournette had a pretty decent rookie season in 2017, rushing 268 times for 1040 yards and nine touchdowns. He also caught 36 passes for 302 yards and one touchdown. That's not bad for a player coming into an offense that had some serious questions going into the 2017 season. So why is he overvalued? Usually you can't really take injuries into account while drafting because they are random and unpredictable. In Fournette's case, however, fantasy owners know there is an injury history with his foot. And Fournette owners' worst nightmare came true last season as he battled foot injuries all year. Fournette is currently being drafted at the end of the first round in 12-team PPR drafts. Now I don't think he is super overvalued at the 1.11 spot, but you always have to think about the potential for an injury for someone with that history. Personally, I'd pass for a more reliable running back unless he falls to the second round. I feel for anyone who was on the Derrick Henry train in 2017. I feel even worse for you if you owned both Henry and Demarco Murray, figuring one would lead the way and the other would be a solid handcuff. Instead what you got was week after week of frustration, and even when Murray would go down with an injury, he'd still somehow play hurt the next week. Henry truthers had about a month of excitement, thinking Henry would now finally have the chance to prove he can be a top back. But the Titans signed Dion Lewis and ended the hype train right there. Even with this knowledge, Henry is still being drafted at the end of the third round (3.10). Now part of this is because so many running backs are being taken in the first two rounds, but he still seems a bit overvalued. No one knows how the offense will use Henry and Lewis. Henry is not a pass catching back either. He has only caught 24 passes over two years in the league. He only rushed for 744 yards and five touchdowns in 2017, so you can assume he will see similar numbers in 2018. Alex Collins was a bit of an unknown running back prior to 2017. He had a good chance to lead the backfield after injuries/suspensions to Kenneth Dixon, and surprised a lot of people en route to a solid 973 yards and six touchdowns on 212 carries. 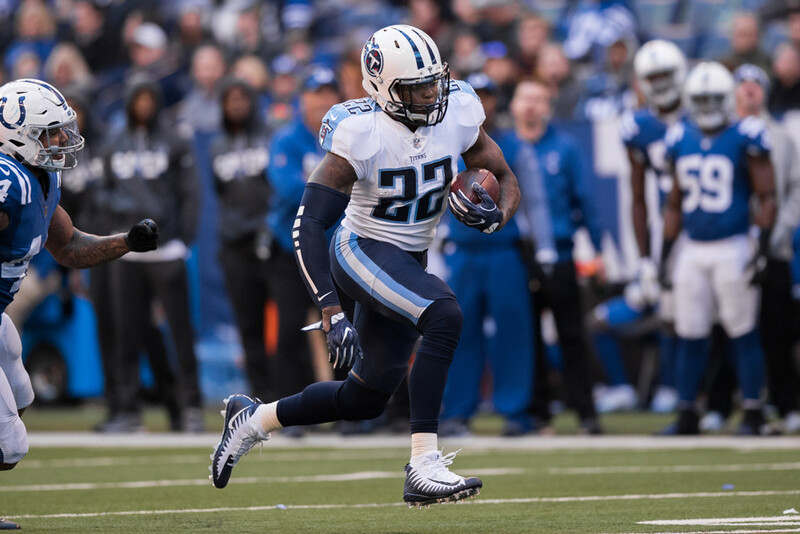 Collins is currently going right behind Derrick Henry in the top of the fourth round (4.01). The biggest problem with Collins is that, for whatever reason, the Ravens seem to want to give the ball to Kenneth Dixon. Dixon has been through a major injury and a suspension, but the Ravens have stuck by him. It's really nothing against Collins, but it seems like even the Ravens don't truly recognize what they have in him. There may just be too much risk drafting Collins so early in the fourth round. If you've read any of my previous articles, you may already know why Rashaad Penny is included on this list. He is currently being drafted at the back of the fourth round (4.11). This is before running backs like Lamar Miller and Mark Ingram (suspended). I'm all for rookie hype trains, but this one may have started a bit too soon. First off, the Seahawk's offensive line is still pretty bad. Their defense has seemingly imploded with all of the players they lost this offseason. And to add to all of that, running back Chris Carson has once again been the talk of minicamp. Now the Seahawks spent a first round pick on Penny, but an unproven rookie with a bad offensive line is not worth a fourth round pick. You also have the risk of wasting your fourth rounder on a guy who is second on the depth chart behind Chris Carson. Unless Penny wows in preseason, he should be drafted a few rounds later. Sony Michel is another rookie running back selected in the first round of the NFL draft. Unfortunately for him, (and fantasy football owners) he was picked by one of the most frustrating running back committees in fantasy. The Patriots seem to never stick with one back. They have Rex Burkhead and James White, who both will see plenty of touches. They also still have Mike Gillislee, who may see some goal line carries. On top of all that, they added Jeremy Hill, who is only 25 and has shown that he can be a very good running back. Michel is currently being drafted at the 5.04 spot, almost two rounds earlier than Rex Burkhead. This seems to be a rather high draft capital for a guy in a rotation with four other backs. Michel also has had fumbling problems throughout his college career, and we all know that one or two fumbles is enough to ride the bench under Bill Belichick. Burkhead in the seventh round seems like a much safer choice.